Hometown: Waldwick, New Jersey, U.S.
Died: December 4, 2007 in Operation Iraqi Freedom. Unit: Army, 1st Battalion, 327th Infantry Regiment, 1st Brigade Combat Team, 101st Airborne Division (Air Assault), Fort Campbell, KY.
Army Sgt. 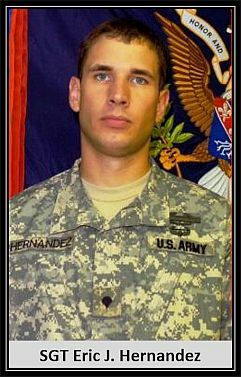 Hernandez was assigned to the 1st Battalion, 327th Infantry Regiment, 1st Brigade Combat Team, 101st Airborne Division, Fort Campbell, Kentucky. He died in Bayji from wounds sustained when his vehicle encountered an improvised explosive device. From the time Eric was a little kid he played army with his friends – he just wanted to be a soldier. He was raised in West Milford, New Jersey where he attended West Milford High School but ended up earning a high school equivalency diploma. After graduation, he knew he wanted to join the military and in October 2003 he did. Fellow soldiers remember him as a good soldier who took care of his guys before he would take care of himself. Eric was a decorated soldier, an accomplished marksman and a leader on and off the battlefield. He was a standout sniper who served two tours in Iraq and was the leader of a small group called the Tiger Force snipers. His awards and decorations include the Army Commendation Medal, the Iraq Campaign Medal, the Army Achievement Medal, the Army Good Conduct Medal, the National Defense Service Medal, the Global War on Terrorism Expeditionary Medal, the Global War on Terrorism Service Medal, the Non-commissioned Officer Professional Development Ribbon, the Army Service Ribbon, the Combat Infantry Badge, the Expert Infantry Badge, the Air Assault Badge, and Weapons Qualification. He was later awarded the Bronze Star and Purple Heart. In his final assignment, he was dispatched as part of a rapid response team to dismantle an improvised explosive device. But the vehicle in which he was a passenger struck another IED on the way there, killing him and two other soldiers. Eric was a compassionate person with a big heart. Several years ago, when his best friend didn't have a reliable car because of financial difficulties, Eric casually gave him his own, saying "You need it more than I do." He was a lover of the outdoors and enjoyed hiking, camping, archery and shooting. The family remembers how he had already made plans for when he left the military – he had taken the civil service test to become a police officer. He wanted nothing more than to have a career in law enforcement. Cremated, Location of ashes is unknown.